For a long time, it was believed that electric and manual toothbrushes are equally effective in removing plaque and keeping healthy teeth and gums as long as you brush twice a day for at least two minutes. But numerous recent studies have proven that electric toothbrushes do a considerably better job of cleaning your mouth and removing plaque and gingivitis. If you have decided to ditch your manual toothbrush and switch to an electrical one, you might find this article useful. We will describe and compare here two of the best and most popular electric toothbrushes available today. These may be more expensive than other available brands, but they come from two of the most reputable companies dealing with teeth and gum healthcare and provide all the features you may need for keeping your mouth healthy, free of plaque and gingivitis. This article will compare the Philips Sonicare DiamondClean and Oral-B Pro 7000 SmartSeries electric toothbrushes. These electric toothbrushes were not just the most popular among Amazon customers at the time this article was written, but they had also received excellent reviews from most Amazon buyers (an average rating of 4.5 stars each out of 5 stars!). Note also that these two products represent the top of the line in electric toothbrushes that both companies offer. Otherwise, please continue reading below for the description and comparison of the two selected electric toothbrushes. The patented Philips sonic technology which uses a unique dynamic action to reach gently and effectively between teeth and along the gum line. The latest sonic technology is able to clean teeth with up to 31,000 brush strokes per minute. The advanced DiamonClean brush head: Each bristle is shaped like a diamond for effective stain removal and offering one of the best teeth whitening systems available today. Indeed, the company claims that the DiamonClean brush head can naturally whiten teeth in just one week and will also gently remove coffee, tea, tobacco and red wine stains. Clean: For everyday cleaning of the teeth. White: To remove surface stains to whiten the teeth. Polish: To polish and brighten the teeth. Gum Care: To lightly massage the gums. ​Sensitive: For a gentler cleaning of the teeth and gums. Rechargeable Battery: No batteries need to be purchased for the toothbrush. It comes with a charging travel case that allows you to take your toothbrush on the go. To recharge, all you need to do is place the toothbrush in the travel case and connect the travel case to your laptop via USB or a wall outlet. A battery indicator light on the toothbrush illuminates when power is running low and the battery needs to be recharged. Note also that the travel case has space for an extra brush head. A Unique Charging Glass: It uses conduction technology as it charges the toothbrush while the toothbrush rests in the glass. The glass can also be used to rinse your mouth after brushing. 2 DiamondClean Brush Heads (standard). 1 USB Charging Travel Case. The clinically proven Oral-B 3D technology which uses oscillations, rotations and pulsations to break up plaque. The company claims that it can remove up to 300% more plaque than a regular manual toothbrush and that it is capable of up to 800 brush movements per second. The Oral-B Pro CrossAction round brush head with perfectly angled bristles for precise cleaning of the teeth. The specially designed brush head surrounds each tooth with bristles angled at 16 degrees that can reach deep between teeth. This allows the 3D cleaning action to break up and remove as much plaque as possible. Daily Clean: Operates with 3D movements for a basic, everyday clean. Gum Care: Features massage mode for the gentle stimulation of gums. Whitening: Alternates between speeds for a gentle polishing on the tooth surface to remove surface stains. Deep Clean: Extends your brushing time for an even more comprehensive clean. ​Sensitive: Operates at a lower speed to gently clean teeth and gums. Tongue Cleaner: Helps clean bacteria from the tongue. A pressure sensor that lights up if you brush too hard to prevent harmful over-brushing, and automatically decelerates the pulsation and oscillation speeds of the brush head. A timer to help you brush for the dentist-recommended two minutes. The timer resides on a separate unit called the SmartGuide which is run by batteries and which communicates with the toothbrush unit through Bluetooth. Note that the timer defaults to a clock when you are not brushing, which is a handy feature. Bluetooth 4.0 connectivity: It is the world’s first electronic toothbrush with Bluetooth connectivity which allows the brush to connect with your smartphone to give you real-time feedback on your brushing habits. Simply download the Oral-B app on your smartphone and connect with Bluetooth to get real-time feedback on your brushing habits which you can monitor over time with intuitive graphs and charts, and store up to 6 months of your personal brushing data. Rechargeable Battery: No batteries need to be purchased for the toothbrush. It comes with a travel case and a charger with extra space for a refill brush head. To recharge, all you need to do is place the toothbrush on the charger and connect the charger to an AC outlet. A battery indicator light on the toothbrush illuminates when power is running low and the battery needs to be recharged. Note that 2 AAA batteries are required for the SmartGuide unit that contains the timer. But they are included. 1 Premium Charger with Refill Head Storage. So, which of the two electric toothbrushes to buy? The two electric toothbrushes considered here are excellent products as shown by the average rating each had received from Amazon customers at the time this article was written. 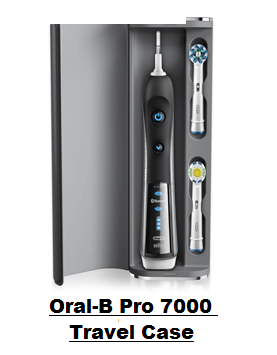 Indeed, both Philips Sonicare DiamondClean and Oral-B Pro 7000 had received 4.5 stars (out of 5 stars). ​ " Individual clinical research has shown Sonicare toothbrushes to be more effective than comparable Oral-B electric toothbrushes in reduction of gingival inflammation and therefore improvement in peridontal health. However, a 2004 review of 29 studies concluded that only electric toothbrushes with rotational/oscillation movement removed more plaque than other brushes when correctly used. ​A second review found no clinical evidence for the dynamic fluid activity of the Sonicare toothbrush being more effective in plaque removal than an Oral-B oscillating/rotating electric toothbrush. Finally, a 2007 study comparing the two found the rotation/oscillation brush to be more effective in single-use plaque reduction. An additional study showed that while both Sonicare and Oral B electric toothbrushes do better than manual toothbrushes in removing plaque, reducing gingival inflammation, and reducing probing depths, the Sonicare showed significantly more improvement than Oral B. " ​Reading the above, you probably have guessed by now that there is no definite agreement as to which is better, but clearly, looking at the mostly raving reviews provided by Amazon customers and the average rating of 4.5 stars both toothbrushes had received, there is a good chance that you would be quite happy with either toothbrush. However, there are a couple of important feature differences you might want to consider before deciding which to get. Oral-B Pro 7000 supports Bluetooth 4.0 communication that allows the brush to connect with your smartphone to give you real-time feedback on your brushing habits, while Philips Sonicare DiamondClean does not. Oral-B Pro can also be operated in the tongue cleaner mode not found on the Philips Sonicare toothbrush. ​Philips Sonicare DiamondClean can also be recharged by simply connecting it to the USB of your laptop. This maybe quite useful when you are traveling and do not want to deal with other countries wall outlet standards. Oral-B Pro 7000 does not support any USB connection. 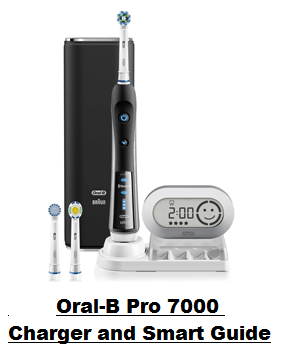 Please click the electric toothbrush of your choice below for price information or to purchase.